Wondering through 홍대 (Hongdae), I came across a café with some of the best tarts I’ve ever tasted! To be honest, what drew me in more than its name was the lovely clear windowed exterior. Avec Nous itself isn’t too big and could probably seat about 30 people, but it is kept spacious. As simple and lovely as its exterior, the inside is given a very natural appeal; furniture is simple finished wood and there are potted plants scattered around and set on the tables, even vivid red flowers panted on random pieces of set glass. It’s refreshingly very simple and it’s all complimented with an open window kitchen so you can see the pastry chefs at work. 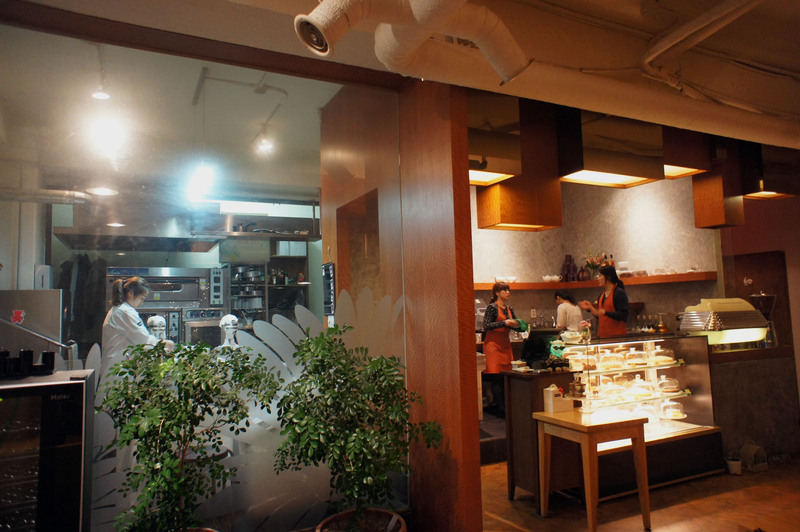 As a baking enthusiast, I really enjoy this part of the café. While this particular café specializes in a wide variety of tarts, their menu also offers an assortment of coffees, teas, smoothies, etc. They also have salads and entrées, although I can never wean myself off the tarts with enough tummy space for real food. I hope to try some of these next time (fingers crossed for self-control). As far as drinks go, I really recommend the royal milk tea. I used to manage a tea house back in college, so I have a huge soft spot when it comes to milk teas. I’m not really a fan of royal milk tea because it usually has a strange aftertaste, but this place manages to somehow cancel it out. Magic? Perhaps. Although it could just be proper brewing. Now on to the tarts!! 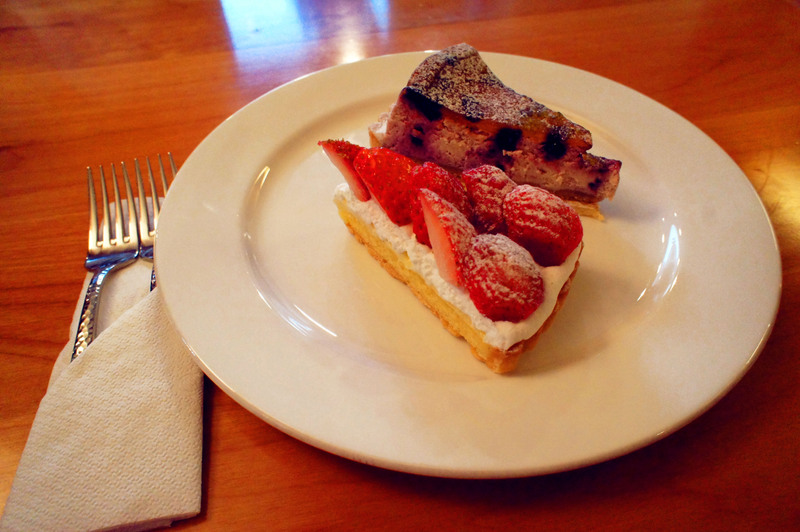 So far I’ve indulged in three different types and my absolute favorite is the strawberry soufflé tart. It was so good I had to have it twice on my first visit. It’s kind of a cross between a tart and a cheesecake. The filling is thick and rich blended with fresh strawberries, truly to die for. I also tried the blueberry yogurt tart, which is essentially the same thing just with blueberries. So if strawberries aren’t your thing, this is the one for you. Lastly, if you prefer a softer creamier tart, the strawberry tart is fantastic. It’s your basic cream cheese tart with freshly cut strawberries on top, but it is made incredibly well. You won’t be disappointed. Another fantastic point about this café is that all of their tarts are constantly being made freshly. They make only make one of each tart at a time, so that as soon as something is finished they make a fresh new one. 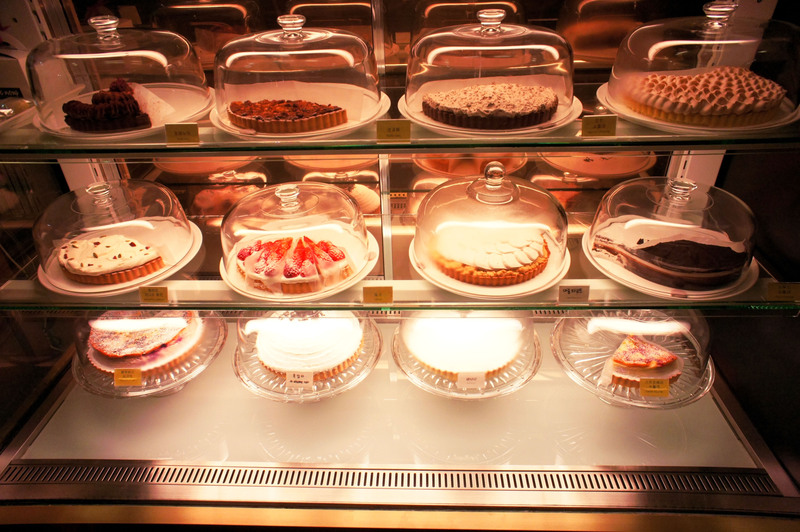 You don’t have to worry about stale pastries here. Also, if you’re interested in baking and have a pretty solid understanding of Korean, they offer baking classes. What more could you possibly as for? So the next time you feel like satisfying your taste buds drop on by Avec Nous. You’ll be glad you did. Happy eating. 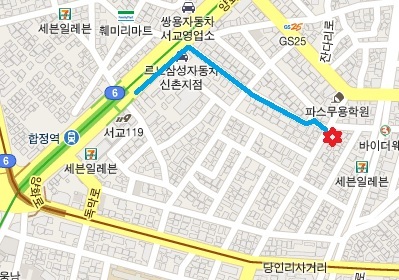 Head out Exit #3 out of Hapjung Station (합정역) on the No. 2 Line (Green). Walk up out of the station until you see a NORTH FACE Store and turn Right. Follow the street and you'll find it in a few minutes. 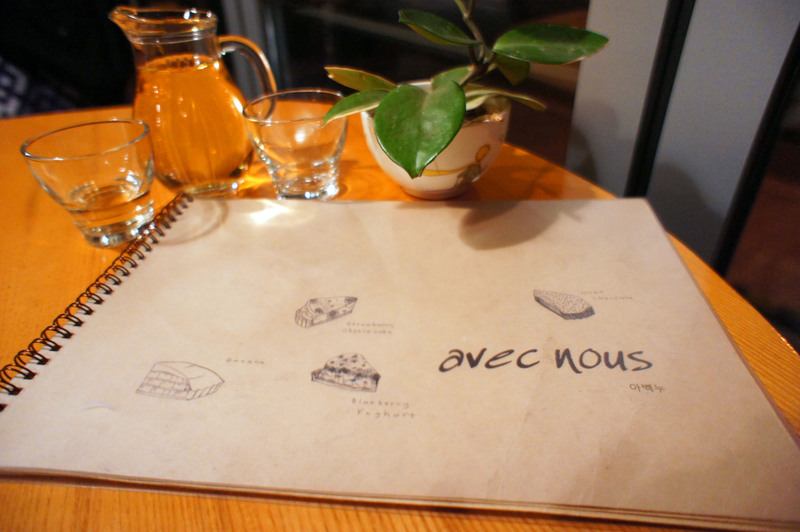 Tags: Avec Nous, Baking Classes in Korea, Best Cafés in Seoul, Cafés, Culture, Food, Hongdae, Hongdae Cafes, 홍대, Photography, Tarts, things to do in Korea, travel, Traveling in Korea. Bookmark the permalink. Previous post ← Battle of the Claw!